In 1997 Jubilee House became the offices of Madeley Parish Council and a leaflet was produced covering the building’s artworks which had been specially designed to reflect its long and varied history. Over time more artworks have been added, many designed by members of the local community and it was decided that the time had come for a new edition of the leaflet which could include these and also tell the story of the building from its construction in 1870 until the present day. This information is from a booklet produced by the Madeley History Group with assistance from John Battye, Richard Bifield, Rob Breeze, Dr. Ivor Brown, Ivor Dickins, Julie Jones, the McGavin family and Peter Taylor. This photo is of the front of Jubilee House in the early 1990s, click to enlarge. of a ‘new town’ centred on the Shifnal to Much Wenlock road (along the line of the present High Street). The medieval market place has been identified as a funnel-shaped widening at the east end of Park Avenue and it was probably in this area that the documented market house was built. The market house was burnt down in the 17th century and the market ceased. It was revived by John Edmunds (Possibly the same John Edmunds who operated as a bookseller and printer with High Street premises in 1791), in 1763, when it was held in the open at Cross Hill (at the junction of Church Street and Station Road) and, later, in the wooden building now known as King Charles’ Barn. The market then moved, first to Madeley Wood then, probably in the 1780s, to Ironbridge. From that time Madeley residents had no market nearer than Dawley or Ironbridge until 1870. A committee was formed in 1869 to re-establish the market at Madeley (a previous attempt having failed) and John Randall was appointed secretary. Not least due to his energy their efforts were successful and the market was reinstated, first in the open air and then in a purpose-built hall and arcade constructed at the west end of High Street in 1870 (the present Jubilee House). Market Day was held on Saturdays and the trade was mainly in vegetables, meat and hardware. The market was not held after 1903 until ca. 1980 when the District Council revived it as a Saturday Market in Russell Square. On the right is a photo of the back of Jubilee House, early 1990s. 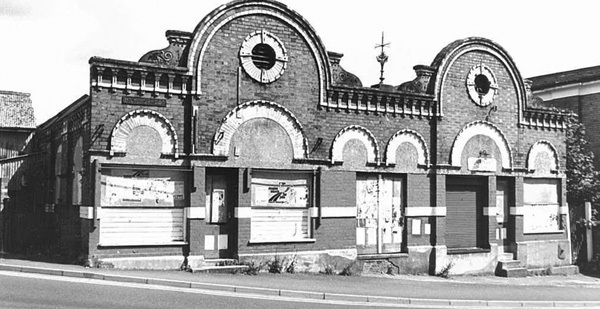 After closure of the market the building was used for a variety of purposes. Several shops opened there including a pharmacy run by Halletts and a greengrocer / fishmonger. Mr G. W. Dickins took possession of the site in the late 1940s and established the Arcade Press Works in the back of the building in 1946. This was later taken over by his brother, Osbourne who changed the name of the company to Jubilee Nut & Bolt Works probably reflecting his other enterprises which were based in the Black Country. In fact, the bolts were made at a factory in Tipton and the Madeley works, which only ever made nuts, was given the local name of the Jubilee Nut & Press Works. 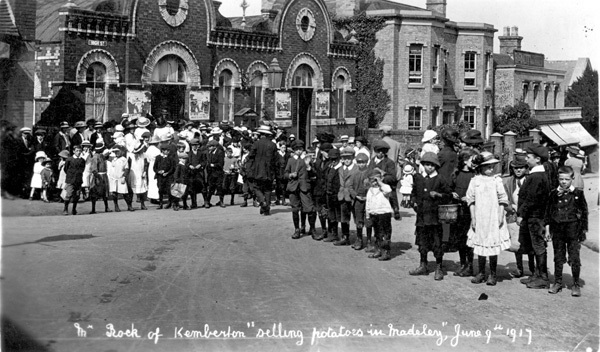 On the left is a photo from June 1917 of a Mr Rock selling potatoes. The works closed in the mid-70s although the front of the building continued to be occupied by retail units well into the 1980s. These included a ladies wear store and a car parts outlet. 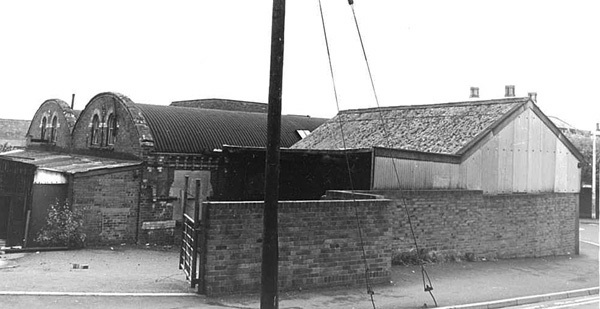 By the early 1990s the site had become derelict and the Parish Council purchased the property to provide Madeley with a large, central community facility which opened in 1997. Only the façade of the original building was retained and art works were commissioned using the theme Time and Passing Time intended to reflect the history of both the building and the parish. It was decided that the building should be named Jubilee House as a reminder of its time as a light engineering works of similar name.